London, January 26 (KMS): Kashmir Campaign Global launched “Free Kashmir” campaign on a section of London transport network ahead of India’s Republic Day, the 26th January, which is observed as Black Day by Kashmiris and Sikhs across the world. The Chairman of Kashmir Campaign Global, Zafar Qureshi, who hails from occupied Kashmir but lives permanently in London in exile, told mediamen in London that a series of campaigns would be conducted across the UK and other parts of the world throughout the year to create awareness about the Kashmir dispute. 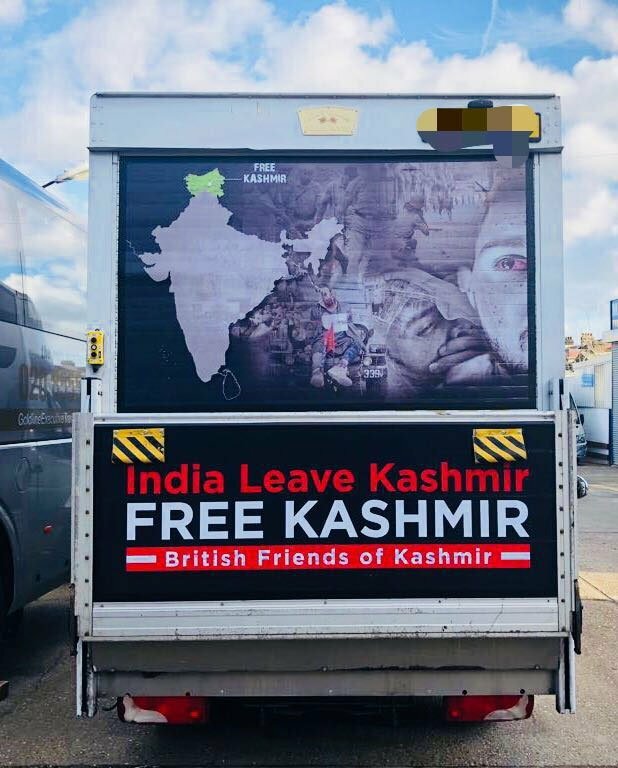 At least seven vans were seen driving around the British Parliament carrying signboards titled “Free Kashmir” in a reference to the occupation of a large part of Jammu and Kashmir by India. New Delhi had illegally occupied Jammu and Kashmir by landing its troops in Srinagar on October 27, 1947 in total violation of the Partition Plan of the Indian subcontinent and against the will of the Kashmiri people. Since then, Indian troops have killed over 100,000 Kashmiris for opposing the Indian occupation and demanding their inalienable right to self-determination. Vans carrying slogans in favour of an independent homeland for Sikhs like “Khalistan Zindabad!” and “Raj Karega Khalsa”, sponsored by the Council of Khalistan were also seen in London. Zafar Qureshi said that it had been 70 years since India, Pakistan, and the world community promised holding of a free and impartial plebiscite in Jammu and Kashmir. He said that India had been suppressing the Kashmiris just struggle by using the Draconian laws such as Armed Forces Special Powers Act (AFSPA) and Public Safety Act (PSA) for the past seven decades particularly since 1989. He said that these black laws gave immunity to Indian troops for their brutal actions as result there were over 95,000 killings, 10,000 custodial disappearances and thousands of unidentified graves across occupied Kashmir while, thousands of half widows were waiting for their disappeared husbands. He deplored that the world still seemed to have turned a deaf ear and blind eye to the atrocities committed by the Indian forces in the occupied territory. The vans carrying pictures of Kashmiri children and women demanded of India to withdraw its troops from occupied Kashmir and give the Kashmiris and opportunity to decide their fate by themselves. The campaign against the Indian brutalities has been supported by a group called “British Friends of Kashmir”. The vans were seen passing from outside 10 Downing Street, Trafalgar Square, Westminster Abbey and Waterloo Bridge. The organizers of the campaign told media that the vans would run in London’s various parts for a month and then the campaign would be initiated in Birmingham, Bradford, Glasgow and Manchester. In the UK, Kashmiris have planned dozens of events across the country to protest against India’s continued denial of the right to self-determination to the people of Jammu and Kashmir. Kashmiri groups have said that the Black Day (January 26) would be marked with protests outside Indian High Commission in London and Indian consulates in Birmingham, Manchester and Bradford. Zafar Qureshi said that the vans would run around London to draw attention towards the human rights abuses by Indian troops in occupied Kashmir and he would be leading the campaign. South Asia Solidarity said that it would hold a vigil “Stand Together Against Modi’s Violence and Hate!” outside Indian High Commission on India’s Republic Day. On the weekend at least 500 Dalit campaigners marched through London against barbaric treatment in India of Dalits by extremist Hindutva groups and support to these groups by the Indian government. Meanwhile, a European Union and Pakistan friendship organisation Thursday arranged an anti-India motor rally in Brussels. According to media reports, people belonging to Pakistan, Indian minorities (including Sikhs and Dalits), human rights activists, and freelance journalists participated in the rally comprising of over 60 vehicles. The participants raised slogans against Indian brutalities in occupied Kashmir and other occupied regions such as Assam, Tripura, Nagaland, Sikkim and Manipur. They were raising slogans, displaying banners (Free Assam, Free Tripura, Free Khalistan, Free IOK, India stop atrocities over minorities) placed on their vehicles highlighting the Indian brutalities. Meanwhile, Kashmir Coordination Committee, UK, headed by Nazir Ahmed Qureshi, is holding a demonstration outside the Indian High Commission in London, today, to mark India’s Republic Day as Black Day. The President of Kashmir Coordination Committee, Nazir Ahmed Qureshi, in a statement said that members of British Parliament, Lord Nazir Ahmed and Lord Qurban Hussain, would address the protesters on the occasion.